In the last decade there has been a widespread adoption of portable ultrasound in point of care (POCUS) for primary care. Its potential for timely assessment and rapid diagnosis continues to attract family doctors, and more and more are getting the necessary training to offer this enhanced service to their local communities. Dr. Pere Guirado, a family doctor based in Catalonia (Spain), has always been an advocate for the use of POCUS in primary care, and describes his goal of becoming common in the country. 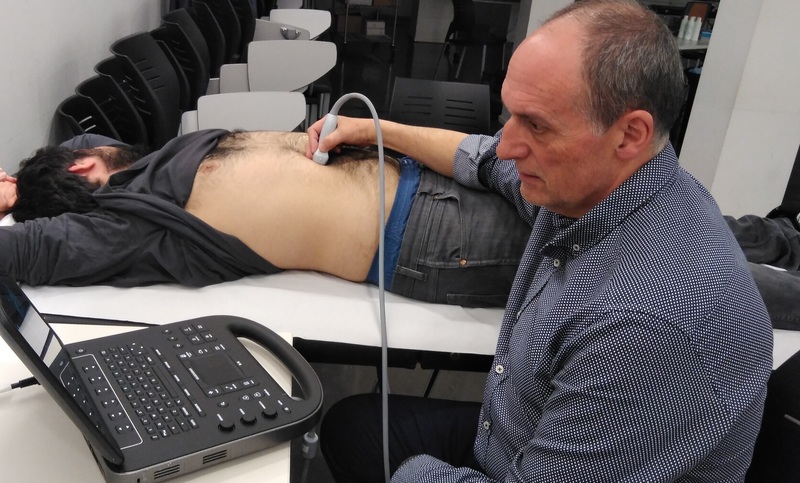 "After working for many years in medicine and exercising directive functions throughout Catalonia, I returned to Primary Care 13 years ago and saw that some family doctors had started working at POCUS. This interested me immediately and I quickly looked for an ultrasound to be able to offer the same benefits to my patients. The Spanish Society of General Practitioners of Madrid offered the only quality course at that time. It was a 10-day intensive course that focused on the technical aspects of scanning and interpretation. When I felt confident about my new skills, I began to perform echographic studies on my patients and I became increasingly convinced of their value in Primary Care medicine. Instead of having to be transferred to the radiology department of the nearest regional hospital and having to wait for an appointment, patients can now go to me. I already know them well and I can take the time to explore them thoroughly, offering immediate security if nothing is really wrong. Although all my patients live quite close to the consultation, this type of service is even more valuable in rural areas, where GPs can only visit a couple of days a week in each local office and patients find it more difficult to go to the hospital. The use of POCUS allows us to carry out in-depth evaluations during our visit. The reaction of patients to ultrasound scans in their local doctor's office or in their own home has been completely positive: their level of confidence increases, as well as their tranquility when they see that you can explore, diagnose and treat the condition from the first appointment. It is essential that portable ultrasound machines are easy to transport, have a quick start and offer high quality images, so I chose the SonoSite Edge II ultrasound system. I work in an office that covers an area of Barcelona with approximately 25,000 inhabitants and, until recently, was the only doctor trained to perform ultrasound scans. This means that I do approximately 1300 scans per year, counting my patients and those of four other GPs. However, this was a problem if I was not available, so it became necessary for several of my colleagues to receive training in POCUS to guarantee the continuity of the service. Now we want to build a care model based on the structure of each clinic, not exclusively for individual GPs, so that there are always two or three people trained anywhere. Another doctor in my office is now qualified enough to carry out the POCUS without supervision, which greatly alleviates my workload. I have also joined forces with other Primary Care physicians who had experience in POCUS (ecoAP group, Catalan Society of Family and Community Medicine, CAMFIC) to establish a training plan for Catalonia, as an alternative to the course that is still offered in Madrid. We have the great ambition to create an "epidemic" of POCUS use in primary care services in our country. The philosophy of our training group is to bring the technique as close as possible to the patient, the essence of POCUS, instead of simply copying the services already provided in hospitals. This program has been very popular and we have completed 19 courses this academic year 2017-2018, which is equivalent to around 500 GPs trained in the use of POCUS. The partnership that we have formed with FUJIFILM SonoSite has been of vital importance for this success, since it has guaranteed us access to the necessary ultrasound systems to provide such training. Practical training and experience are vital to maintain the quality of teaching, which may require 26 systems at a time, in a training place for the largest courses, as happened this summer at the Faculty of Medicine of the University of Vic (200 students, 50 professors, 14 different clinical ultrasound workshops) and shows a significant commitment on the part of the company. As a result of this training initiative, and with the assistance of my Primary Care medical colleagues trained in the use of POCUS, we are now experiencing great advances in the use of ultrasound in the communities. The challenge now is to demonstrate the profitability of this approach to managers and authorities in these difficult times of austerity. We are actively building a test base to demonstrate that investment in ultrasound and training at the Primary Care level not only improves the health of local populations, but also reduces waiting time, patient uncertainty, pressures on hospital services and these can devote their time to more complex techniques, which leads to cost savings in real terms and ensures a more sustainable future." Reducing the time to make an accurate diagnosis is a critical need. The SonoSite Edge II features an easy-to-use interface for intuitive access to frequently used functions like gain and a wide-angle display with an anti-reflection coating for minimal adjustments during viewing.